Streaming FLASH VIDEO >>> Our new videos use Flash format for easy playback. Click the Video thumbnail and the Video will start playing. The PLAYLIST has 70+ videos you can view. Click the < and > arrows below the thumbnails to Navigate the PLAYLIST. Please submit your Shooting and Reloading videos to the site. Send them to mailbox [at] 6mmBR.com and we can host them here! You don't need a Video Camcorder to make movies anymore! Most modern digital still cameras WILL record surprisingly good videos, complete with sound. Just set the mode to "Video" or "Movie", push the shutter release to start, and push it again to stop. Upload videos to your computer just as you do with digital stills. If you DO opt for a dedicated Video Camcorder, we recommend one of the new Canon series of video cameras with Flash Memory. These record directly to digital memory, so there are no tapes to jam or CD heads to crash. In fact, there are no moving parts. We recently obtained a Canon FS10 for this website. It is phenomenal. It's fast and records up to five hours with internal Flash Memory, and up to 10 hours with an extra drop-in 8 Gig memory card. It has "pro" features like microphone jack, backlight correction, and image stablization. It takes superb quality videos with rich colors and fine detail. And there is an even more sophisticated version HF10 Version that delivers High Definition, broadcast-quality video, ideal for playback on a wide-screen TV. Here are three FREE web-based shooting games to challenge and entertain. The varmint game is pretty easy (Requires Flash-enabled browser--you may want to turn down your speaker volume). The Vitual Benchrest game from Benchrest Russia, www.Benchrest.Ru, can be quite challenging--you really need to watch the wind. It challenges you to deal with changing wind velocities and angles in real time. Use your mouse to move the cross-hairs. After a shot you'll see the sight picture move up with "recoil". Just use the mouse again to recenter the reticle. A timer is running like in a real match, and you get a set of sighters before shooting for record. 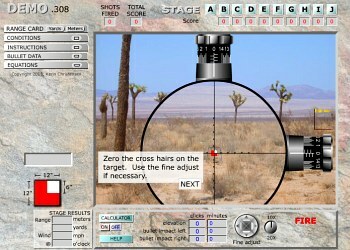 The third program, Shooter Ready, is a Flash-based online Demo of a Long Range Shooting Simulator. This is a sophisticated program that lets you test your ranging and wind-reading skills in a variety of different scenarios. If you have the correct web browser plug-ins AND if you have a high-speed connection, you can left-click the icon next to each video. This will launch the player and stream the video. Otherwise, right-click the icon and "Save As" the video to your hard drive. Then you can play back the video any time. These videos have better resolution than the highly-compressed Flash Videos.